Dave Wils doesn’t want to think about the viewing audience when he takes the stage at 8 p.m. tonight at the Democratic National Convention in Philadelphia. The Wells Fargo Center holds just a shade under 20,000, but given live streaming of the convention and video on C-SPAN, mixed with the occasional coverage for the less renowned speakers on the national news networks, millions could hear this Guilford County teacher’s speech on student debt Thursday night. Wils, a North Carolina Democratic delegate and eighth-grade social studies teacher at The Academy at Lincoln—a Greensboro public school—knows this is his biggest stage ever. A New Bern native who migrated to Michigan for his education before returning to begin teaching in Greensboro almost three years ago, Wils knows student debt well. His wife is in school obtaining her degree right now. 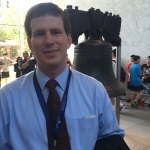 We talked to Wils about his experience this week in Philadelphia, and about the tumultuous political climate for educators in North Carolina today. Policy Watch: What’s it like up there in Philadelphia right now? PW: What do you hope people take away from tonight’s talk? DW: “There are people out there who are doing the right thing, going to school working hard, but they aren’t able to get ahead because of the rising cost of college attendance and the increase in student debt. It’s doubled in the last decade to $1.2 trillion, and that’s just an obscene amount of money. PW: Can you talk about what it’s like to be a teacher in North Carolina today? DW: “People are beat down. Teachers have got low morale. I walk around the hall and I talk to teachers, and very rarely do we have the conversation that we love what we do. It’s usually about the fact that we’ve got these new standards that we have to meet without having the resources to help us meet them. My own subject, eighth grade social studies, that curriculum changed five years ago. I do not have a textbook that reflects those changes. There are schools in our county that don’t have toilet paper for their bathrooms. And in spite of [state leaders] bragging that we’ve got raises, yeah, [they] increased my pay, I’m a newer teacher and that’s great for me. But I’m also a Democrat and I believe in the greater good. These veteran teachers who, two times now, have been completely left out of these raises, that’s completely ridiculous. I just don’t think that is a recipe for success. PW: The country is in the midst of a huge debate about public schools and the role of school choice in education reform. And it’s a debate that’s really heating up in North Carolina these days. Why do you think it’s important that a national audience hears from a North Carolina public school teacher right now? DW: “I’m not going to be able to talk about school choice in my talk, but I hope that people will look at what’s going on with regard to school choice in North Carolina and see what a shame it is. The way school choice works is whether you go to a private school based on help from vouchers or whether you go to for-profit charter schools, the deal is a select few students are being pulled out of these public schools, which means those resources that are attached to per-pupil spending are also being pulled out of public schools. So many people, including members of my own party, have said that school choice is the way out of poverty for certain students. But it’s not lifting our students up. Instead, it’s robbing our schools. It’s hurting students that are left behind. That’s not the way. Public schools are supposed to lift everybody up. If you can afford to go to a private school, go ahead, by all means. But public school is supposed to lift everybody up that goes to those schools, and by advocating for school choice, what’s happening to these public schools is they’re being robbed of their resources.